We have previously used RFID in many of our RFID projects and already built a RFID based Attendance System using 8051, here we are going to build RFID Based Attendance System using Raspberry Pi. In this RFID based Attendance System project, we will explain you that how can we authorize and count attendance automatically by using RFID cards. RFID Technology (Radio Frequency Identification and Detection) is commonly used in schools, colleges, offices and stations for various purposes to automatically keep track of people. Here we will count the attendance of an authorized person by using RFID. If you are not familiar with Raspberry Pi, we have created a series of tutorials and raspberry pi projects, with interfacing with all the basic components and some simple projects to start with, do check. RFID is an electronics device which has two parts - one is RFID Reader and other is RFID tag or Card. When we put RFID tag near to the RFID reader, it reads tag data serially. RFID tag has 12 digit character code in a coil. This RFID is working at baud rate of 9600 bps. RFID uses electromagnet to transfer data from Reader to Tag or Tag to Reader. Here Raspberry Pi 3 is controlling the whole the process of this project (User can use any Raspberry Pi Board). RFID Reader reads the RFID card ID, this data is received by Raspberry Pi through UART, then RPi validates the card and shows the results on LCD screen. When a person put their RFID tag near over the RFID reader to scan, RFID reads tag’s data and sends it to Raspberry Pi. Then Raspberry Pi reads the Unique Identification Number of that RFID tag and then compares this data with predefined data or information. If data is matched with predefined data, then Raspberry Pi increments the attendance of the tag’s person by one and if matched is not matched then microcontroller shows ‘Invalid Card’ message on LCD and buzzer is beeping continuously for some time. And here we also added a push button to see total no. of attendance of all the students. Here we have taken 4 RFID tags in which three are used to record the attendance of three students and one is used as a invalid card. Circuit diagram for this Raspberry Pi Attendance System Project is very simple, which contains Raspberry Pi 3, RFID Reader, RFID Tags, buzzer, LED and LCD. Here Raspberry Pi controls the complete process like Reading Data coming from the Reader, comparing data with predefined data, driving buzzer, driving Status LED and sending status to LCD display. RFID Reader is used to Read RFID Tags. Buzzer is used for indications and driven by inbuilt NPN transistor. LCD is used for displaying status or messages on it. Connections are simple. LCD is connected with Raspberry Pi in 4-bit mode. LCD’s RS, RW, and EN pin is directly connected at wiringPi GPIO 11, gnd and 10. And data pin are connected at wiringPi GPIO 6, 5, 4 and 1. A 10K pot is used to set contrast or brightness of LCD. Buzzer is connected at wiringPi GPIO pin 7 with respect to ground. Three LEDs are connected for student indication with respective RFID card. And one LED is used to show that system is ready to scan the RFID card. A push button is also connected at wiringPi GPIO pin 12 to display the Attendance Count. RFID reader is connected at UART pin (wiring GPIO pin 16). Like in Python we import import RPi.GPIO as IO header file to use the GPIO Pins of Raspberry Pi, here in C language we need to use wiringPi Library to use the GPIO Pins in our C Program. We can install it by using below commands one by one, you can run this command from Terminal or from some SSH client like Putty (if you are using Windows). Go through our Getting Started with Raspberry Pi tutorial to learn more about handling the Raspberry Pi. Now first we have included some libraries and define pins that we need to use in this code. After it, define some variables and array for calculation and store values & strings. Given void write function is used for sending data to LCD. Given void clear() function is used to clear the LCD, void setCursor is used to set cursor position and void print for sending string to LCD. void begin function is used to initialize LCD in 4-bit Mode. void buzzer() and void wait() functions are used for beeping the buzzer and for wait to again placing card. Function void serialbegin is used to initialize the serial communication. In void setup() function we initiaze all the GPIOs, LCD and serial UART. Given void get_card() Function is used to get data from RFID reader. In void main() function, we have showed some messages on LCD and compared the tag data with predefined data to validate the card with below code. Finally void check_button() function is used for showing total attendance on button press. 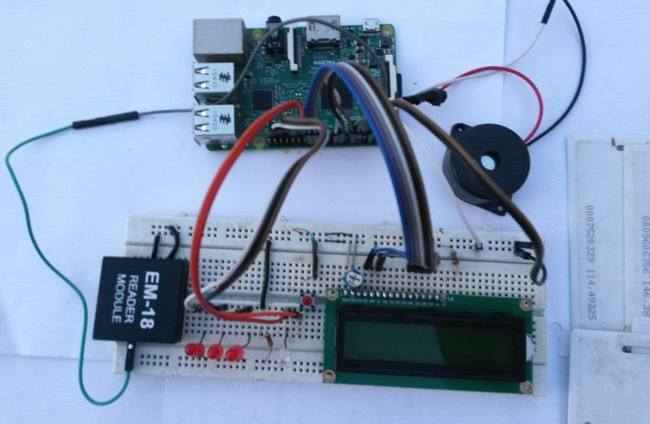 Check the Full Code for this Raspberry Pi Attendance System below. Can you please tell me that how should I read the the 12 bit string from RFID reason using PYTHON language? I tried it for Raspberry pi 3 but it does not display anything like the cursor is stuck. First of all you should make sure that your UART is enabled and working. Please consider using the serial port aliases in Raspbian; /dev/serial0 points to the primary UART on each device - /dev/ttyS0 on Pi3, and /dev/ttyAMA0 on Pi2. sir can u please explain me how to run and compile this c code in raspberry pi . sir i am wondering if i would replaced RFID reader with another one have long distace (10- 15m) ... is there any change in software or hardware ? Could you able to tell me that whether i can use PIC 16F877A for RFID PROJECT. I want to ask something, I want to put camera in my project for take picture the person who swap the tag..how? When i run this Code ..